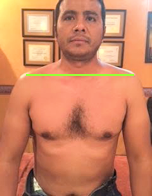 This exceptional clinical case was contributed to JMS by our student Juan Luis Ordaz Sabag, DVM, CMMP, LMT from Mexico who recently graduated our Medical Massage Certification Program. Juan Luis has a long and productive relationship with SOMI and once was featured as Person of the Month in issue #3, 2015. He lives and successfully practices Medical Massage in Terreon, Mexico. Being a Doctor of Veterinary gave Juan Luis a better and quicker understanding of the important role Medical Massage plays in patients’ treatment. He meticulously documents in pictures and notes every one of his clinical cases and the progress of its treatment. It makes his contributions to JMS priceless because readers can learn a lot from real clinical photos and author’s notes. While reading Juan Luis’s case, notice how creative he became with his clinical decisions. This is what we expect from our students who eventually become Massage Clinicians. It is a mistake to blindly follow the treatment protocol offered by any educational source. It puts the therapist’s mind in a box mentality which has nothing to do with clinical reality. In medicine, including MT, nothing is written in stone! In the textbook or during the class you presented only with average scenarios while the clinical reality is much more complex. The efficient therapist arranges techniques and modalities not based on recommendations from educational sources, but only on the detailed evaluation of clinical symptoms. This case is a great example of the creativity we expect from our students when we finally free their minds from the box mentality. In May a 36 year-old male visited our clinic with complaints about pain in the middle back, upper right shoulder with ‘pins and needles’ sensations in his right arm and face. He also noticed that recently he developed uncontrollable muscle jerking. He’s had these sensations on and off for the last 10 years, but in the last 12 months they have really intensified. During past years he was treated by a family physician and physical therapists and consulted by several orthopedists and neurologists. The patient was diagnosed with intervertebral disk herniations on the levels C3-C4 and C5-C6. He also has mild lumbar scoliosis to the right. After years of different therapies, he was recommended cervical surgery, which he would like to avoid. Detailed questioning identified the following pain pattern: patient feels acute pain in the posterior neck, especially the suboccipital area, right upper shoulder, middle back, anterior neck bi-laterally, both parasternal. Aching pain radiates along his entire right upper extremity. Burning sensation in the middle back between the scapula and vertebral column and on the hand along the ulnar nerve distribution. All of that indicated significant sensory deficit within distribution of many spinal nerves. Multiple active trigger points were detected in the muscles of the right neck, shoulder and upper extremity (anterior scalene, lower and upper trapezius, rhomboids supraspinatus, pectorals). 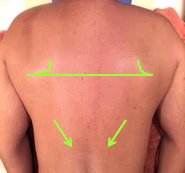 Active Connective Tissue Zone in the skin and superficial fascia were detected in the middle back and in the posterior shoulder with thickening of skin, stretch marks and pigmentation which suggested the presence of Cutaneous and Connective Tissue Zones in the first (skin) and second (superficial fascia) layers. The significant restriction of the trapezius muscle’s mobility indicated the presence of the Connective Tissue Zones in the third level (deep fascia) in the middle back. Periostal trigger points were active in the spinous processes of the lower thoracic vertebrae between T9 and L1. Wartenburg’s Test which indicated tension in anterior scalene muscles was positive bi-laterally, but with extreme withdrawal on the right. It pointed to the irritation of both brachial plexus with its compression on the right. Motor Test on the right showed hand weakness in Ulnar and Radial Nerve Distributions. The X-ray indicated presence of mild right-side scoliosis. It was obvious that over the years the patient developed chronic, multilayered pathology and it must be approached as a mix of reflex and local abnormalities. To address all issues and not leave even one stone unturned I decided to combine treatment protocols suggested by the Science of Massage Institute and based their mix on the data I obtained during the patient’s evaluation. I started first with the application of Anterior Scalene Muscle Protocol to free brachial plexus from irritation and after that add Trapezius Muscle Syndrome Protocol. Thus, first of all I targeted the reflex component of my patient’s clinical picture. Following two treatments the patient reported less tension in the neck, upper and middle back. The uncomfortable sensation in the upper extremity were still present. The patient also exhibited great sensitivity along the 5-10 intercostal spaces on the right side and to address that I decided to add elements of Rhomboideus Muscle Syndrome protocol. As a result of application of the combined treatment I noticed significant decrease in the fascial tension and restoration of skin elasticity in the middle back and the patient reported that he no longer feels tingling and numbness in the right side of the face. After two more sessions Wartenberg’s Test became negative which means that ASM freed brachial plexus from direct irritation. The patient had mild to moderate sensory abnormalities only on the forearm and hand with full restoration of sensations on the back, shoulder and arm. Considering the weakness of posterior shoulder muscles, I added elements of Medical Massage Protocol for Rotator Cuff Syndrome. 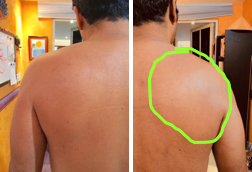 After adjusted treatment I noticed improvements in the skin’s elasticity and complete disappearance of fascial tension in the right posterior shoulder which was a very prominent symptom from the very beginning. Also, the function of his posterior shoulder muscles started to slowly improve. At this point the patient added active exercises and yoga to energize and revitalize the soft tissues and restore balance between both divisions of the autonomic nervous system. As a result of combined treatment and rehabilitation strategy the only symptoms the patient exhibits at this point is 1-2 level of occasional tingling sensation on his right hand. I expect these symptoms slowly to fade away while ulnar and radial nerves continue to recover from chronic irritation. What was interesting and unexpected is that the patient’s skin showed a significant decrease in intensity of dark pigmentation over the spinous processes of the lower thoracic vertebrae. That meant that initial pigmentation was indeed a consequence of cutaneous reflex zones formation. I freed cutaneous branches of the T9-L1 spinal nerves from irritation by tight fascia and restored normal innervation of matching dermatomes and the skin restored its elasticity and even color.